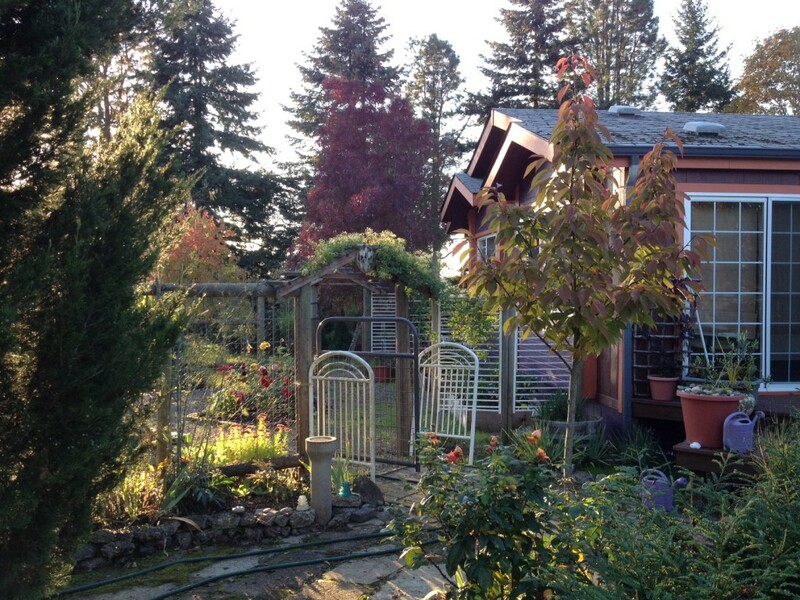 The gardens around our house in October – still lots of flowers and a thousand different colors. September did not promise the fine weather we have had this past month, and the heavy rains in the last part of September did terrible damage to our neighbor’s harvest of Pinot Noir. But October has been both incredibly beautiful here, and incredibly busy this year. Our tasks since the last posting have included breeding our goat does for the spring, cleaning up the garden for the winter, putting in winter crops, harvesting the last of what we put in this summer, planting a fruit orchard, bottling all the cider pressed in September, and adding hogs to our repertoire of animals. The month started with the visit of a couple of friends from the coast over the first weekend of the month, Jen and Dan, who Lori knew from her days of starting River People Farmers Market up in Astoria; they were eager and willing to help clean up our large garden and put it to bed for the winter. The four of us spent an entire back-breaking morning tearing out the remaining cucumber, squash, and tomato plants as we prepped the garden for winter. (And boy, did we have the reserves after Jen and Dan prepared us a fabulous breakfast!) We heaped the detritus into a massive pile that we’ll compost down during the next few months, before tilling it back into the ground. Good weather meant the garden stayed dry enough for me to take a tractor into the garden and till up the soil; we scattered a cover crop of vetch, field peas, winter rye, and clover to help build up tilth in the soil. 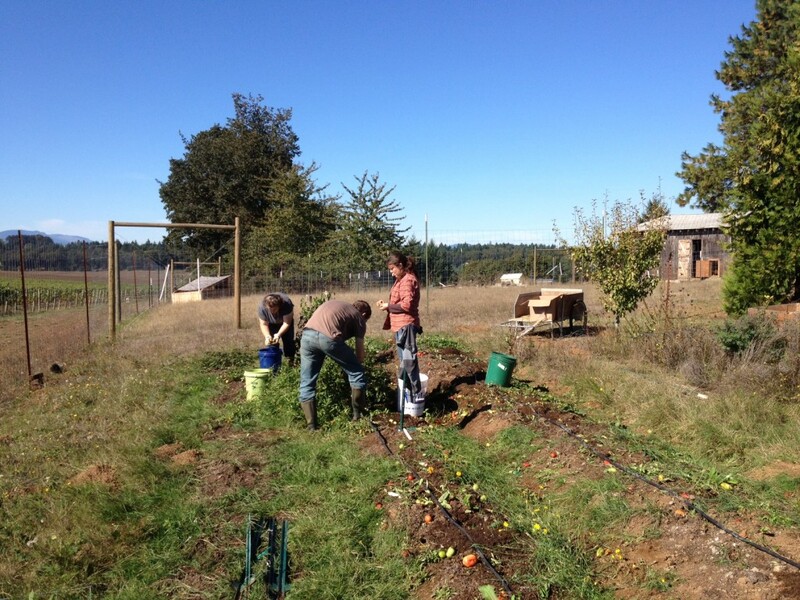 Jen and Dan help Lori and myself clean up our patch of tomatoes for the year on a warm Saturday morning in October. We also made the decision to put a full quarter of the garden, the northeast quadrant, under permanent fruit cultivation. One of our lessons this summer was that a full quarter acre garden is too much for one or two people to hand till and grow organically as an annual garden, which is what a vegetable garden in essence is. It will be difficult enough in coming years to keep three-quarters of it under cultivation. So we put in eight more trees, in addition to the one apple, two plum, and two pear trees in the garden already; in our duck pen we already have a cherry, plum, apricot, fig, and peach. Our new additions include a Cox’s Orange Pippin apple in the duck pen to replace the Charlotte Peach that didn’t survive this summer, while in the garden proper I added an Amere de Berthcourt apple, an Oullin plum, a paw-paw, a Puget Gold apricot, a Charlotte Peach (hope springs eternal! ), and a Nanaimo Peach, with a large Amere de Berthcourt planted in the south-east corner (everything I plant is semi-dwarf, but this tree should get to full size). 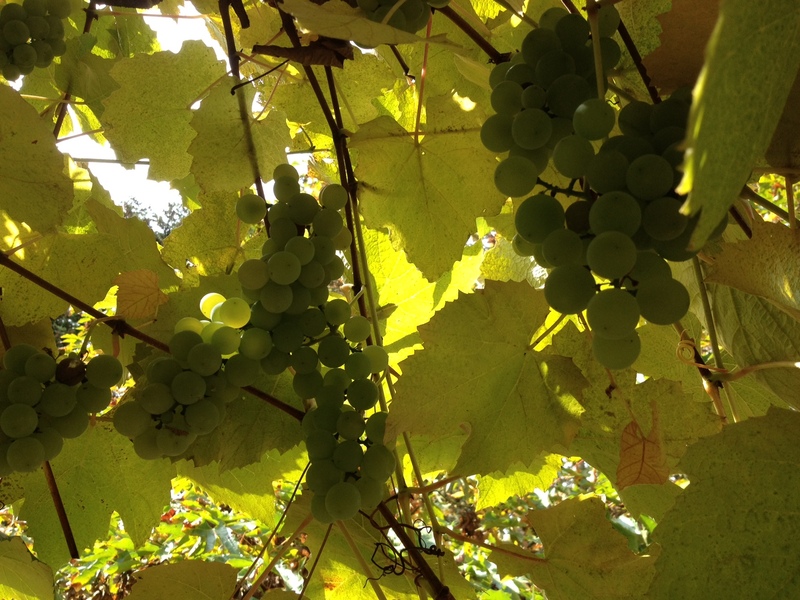 We harvested about five gallons of grapes from our little vine in the back this year and squeezed out a gallon and a half of juice – the chickens got to feast on the mash! So in addition to some already existing plum and cherry trees, our pre-existing apples, and the eight Amere de Berthcourths planted this spring, we now have eight more trees, and we will say a prayer to Vortumnus, the Roman god of fall fruit, that they thrive and prosper. I may add as many as nine more fruit trees come spring. Why have we morphed into Johnny Apple Seed? 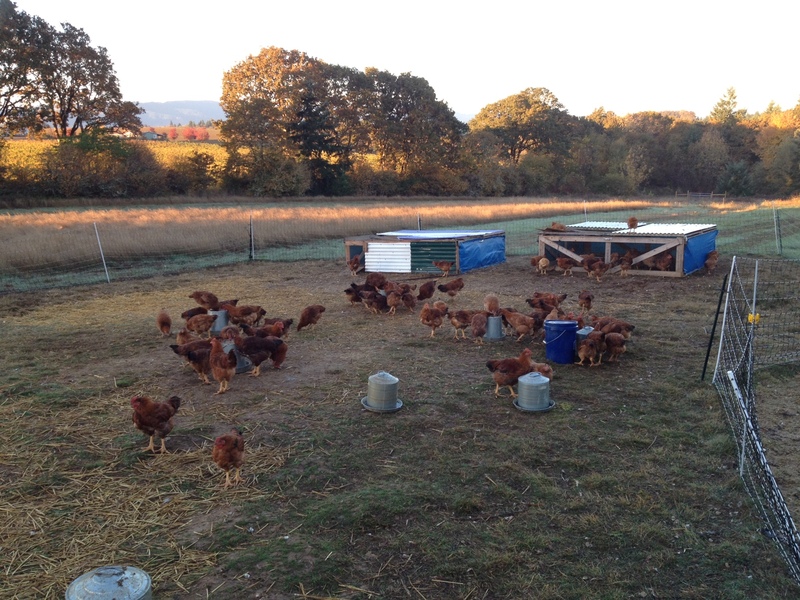 Our hundred broilers out on pasture on a beautiful October morning. They have been so to grow so we are giving them an extra month out on pasture before processing them. 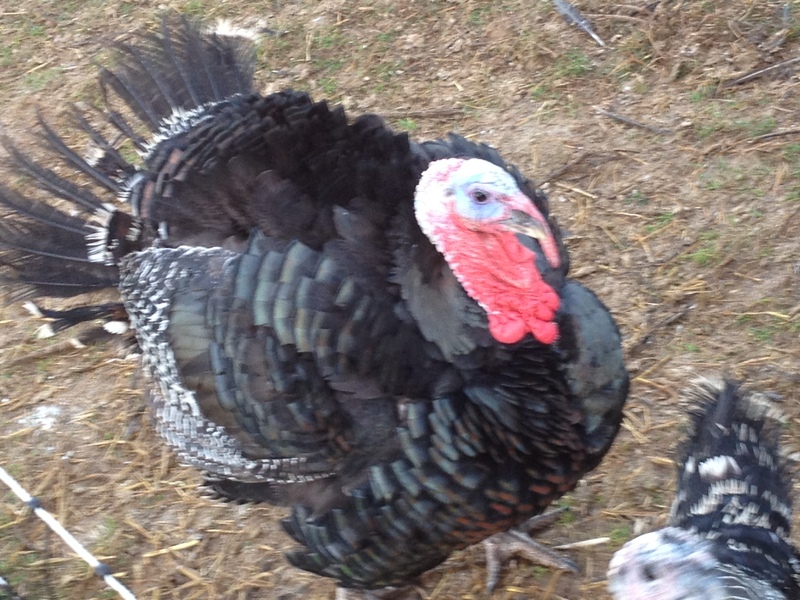 Our thirteen broad breasted turkeys strut their stuff as they wait to be fed . . .
. . . and are so ugly that they’re beautiful! Their wattles, by the way, expand and contract, so the appendages that hang both over and under the beak can enlarge if they want to show off, as this dude here is doing as he poses for the photo. 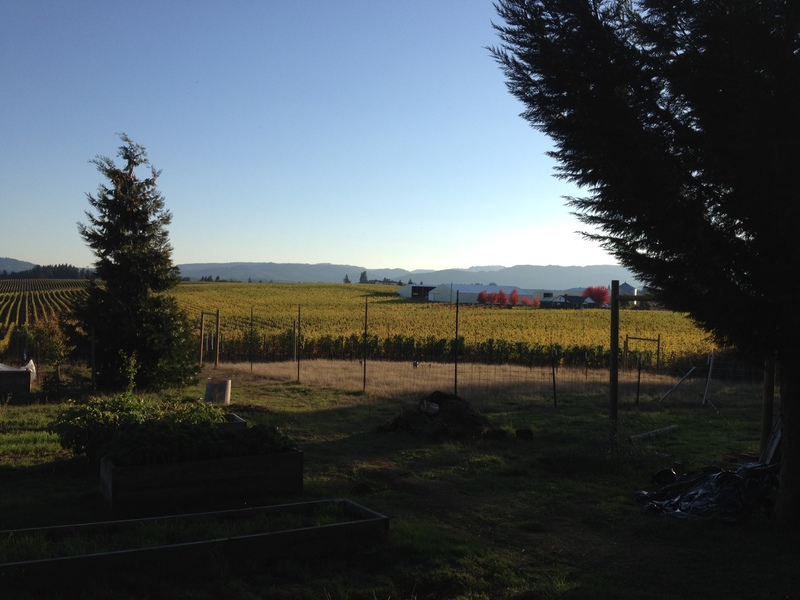 Of course, there is the hard cider operation – I want to plant more apple trees so that I can average about 50 gallons of hard cider that I produce a year, about all that I have the time or energy for! But we also came to the simple realization that, as far as input for our animals, fruit rather than seed or grain production is the way to go. It means less purchased feed for us; even in the best of years, I suspect, the time and effort expended on producing even a bumper crop of sunflowers and seed will be far less than what we can expect from a poor fruit year. And even in a poor fruit year, there will be plenty for us and our animals. In addition, a little bit of research indicates that in less affluent regions of the world fruit, not grain, is what farmers give to animals. It gives chickens, goats, and other animals a real treat in addition to a burst of calories, and improves the quality of the eggs, milk, and meat. Moreover, it simply seems easier to produce: the tree is put in once, tended just a few times a year rather than almost daily, requires less water, is pruned just once, then harvested. And the leaves, at any rate of the apple trees, is something our goats really love to munch, so once harvested we can cut off the water shoots and feed them to the girls to their hearts content. So while we will continue to grow zucchini, pumpkins, melons, tomatoes, and potatoes annually (in addition to other veggies), our effort to minimize outside input will focus on rotational pasture management and fruit production. 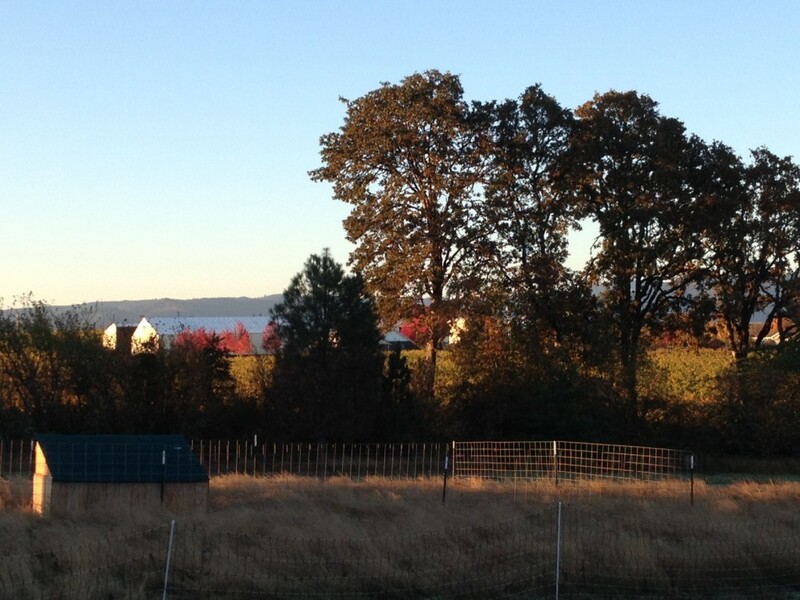 In the next few weeks our pasture should at least be paddocked off into four lots. We intend to alternate on a goats-chickens-hog-fallow/seed system. That is, we will have our goats graze one paddock, followed by the chickens for scratching for the worms, bugs, and parasites attracted by the manure, followed by the hogs to root up and till the whole thing, followed by planting with cover crop and liming. 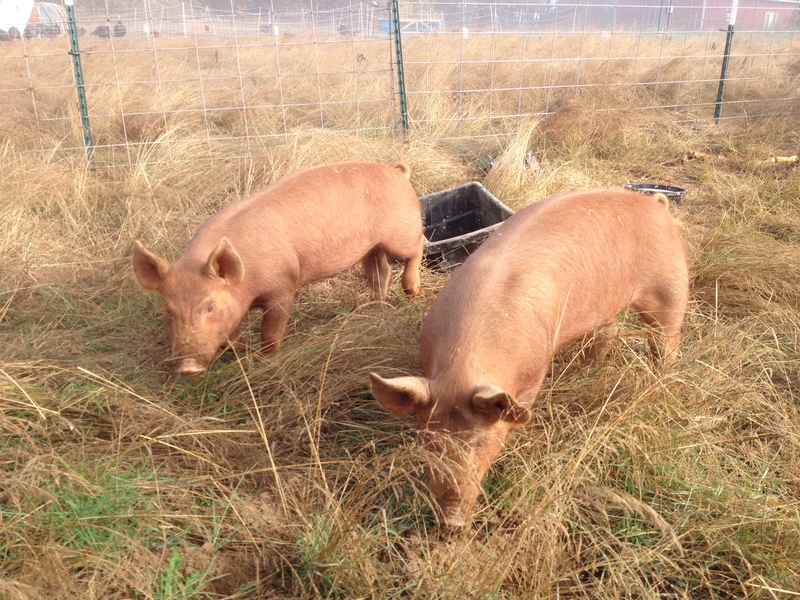 October also the new addition on our farm of hogs, two female Tamworths that we bought from our friend Susan Richmond over in Willamina; Lori and Nancy have named them Laverne and Shirley, and they are great – an entirely new and very endearing experience. They are wonderful animals: currently they are living behind hog panel in the pasture, but we plan on taking that down and letting them range behind a wire I’ve run over about a quarter of the pasture, though right now they seem more than happy to root in their enclosure. The most immediate thing one learns about pigs, as Susan noted to us, is that pigs are about pleasure: they love to wallow in mud, give themselves dirt baths, snuggle together and nap, eat all manner of treats including and especially goats milk of which we have more than enough, and to get the occasional massage or scratching. There is a life lesson here somewhere. They are also very vocal and communicative creatures, and will greet and converse with you with a variety of assorted squeaks and grunts. A morning walk around the farm as we do some chores; in the pasture is the temporary hog pen we set up – I’ve now run a single wire in this part of the pasture so our hogs can range a lot further and root to their piggy-hearts content. 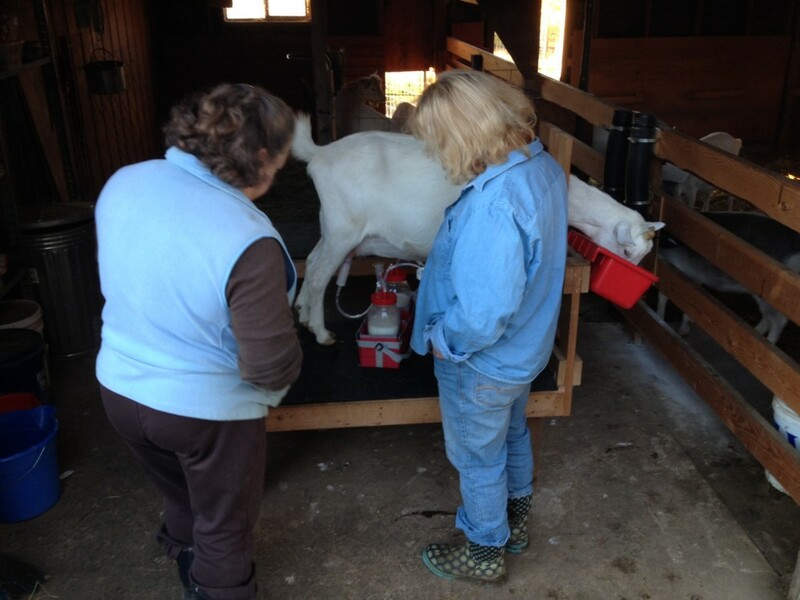 Lori and Nancy operate the new Henry Milker we bought – a God send for our hands and tendons! While we are still making cheese, our current plan is to expand our milk operation to have more on farm feed for our hogs, who absolutely love goats milk, something that will also improve the quality of their meat. 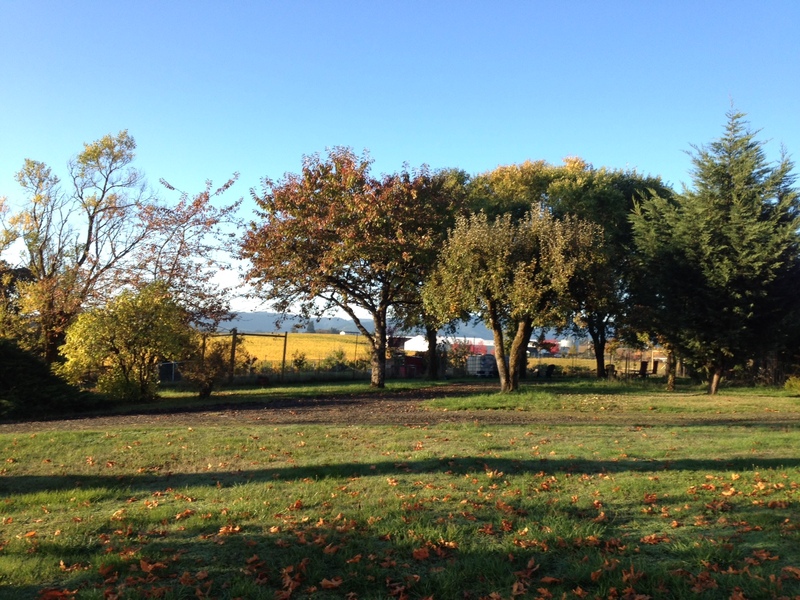 The front drive of our property at 8:00 in mid October – the cherry tree in the middle eventually turned a lovely orange, but was impossible to capture with a camera. The circle garden during breakfast in October. 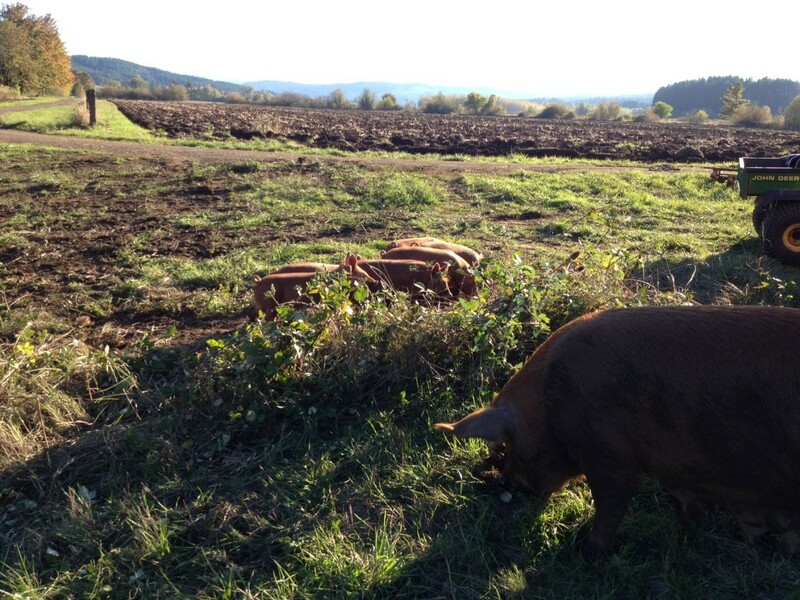 We last met Leila the Tamworth in December, during a visit to Susan Richmond’s farm over in Willamina. Well, here we are again after she has now been a mama for about 8 weeks, happily snuffling with her brood. Leila’s offspring, whom Lori and Nancy dubbed “Laverne and Shirley” (Laverne has the bigger ears! 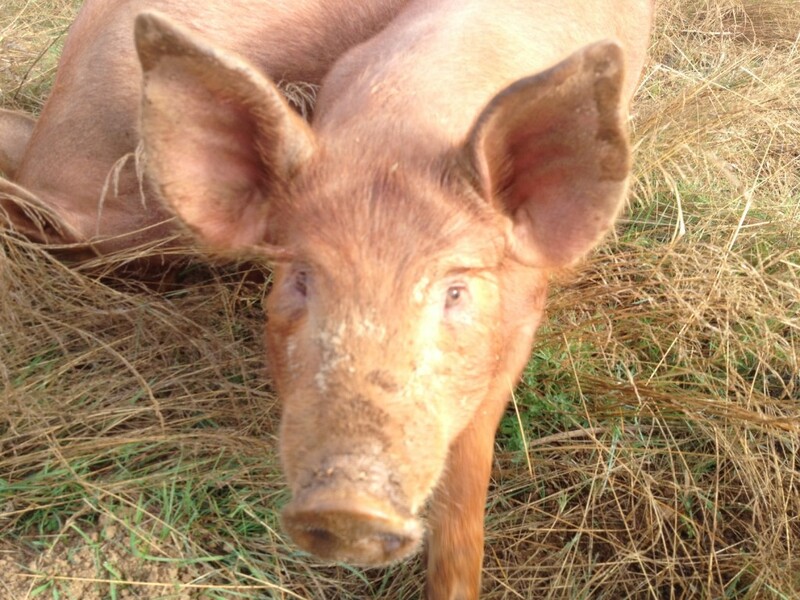 ), now live on our pasture, and seem happily content! Laverne investigates the big guy who brings the food a few times a day! This past month was also very busy with breeding, as our girls came into heat. Leah we bred three weeks ago this past weekend, on the 5th of October, while Margeruite and Janet were bred on the 22nd. Unfortunately we have had a couple of break outs by the boys, and they have also gotten to our young doelings, Eris and Pandora, which leaves us with a real conundrum about what to do – have the vet in to terminate their pregnancies or let them go to term and hope for the best? They are big girls, so they might be able to pull it off, but I must admit I’m both nervous for the safety of the girls at their young age and a bit chagrinned at our poor management of the situation (though no matter what you do, it seems farming is little more than crisis management). In defense however, we are still waiting for the fence builders to come and paddock off the pasture, and after that things should certainly be much more manageable. It was a real hoot, I must say, setting up the date with our little greenhorn buckling Benny, and the “older women” of the herd. They had to show him a bit of the ropes, and he himself seemed a bit at sea, despite our best efforts to set the mood (I put on Frank Sinatra for our goat dates – if that doesn’t put them in the mood I figure nothing will). But he appears to have gotten the job done; it is rather humorous how much a human needs to be involved – you actually need to make sure the little guy “hits the mark”. The really hilarious but also rather sad thing that happens to the buck, at least younger ones, is that they literally go slack when they climax and fall bass-ackward on the ground looking both stunned and confused. And there is noooo mistaking when these little guys are in rut or the gals in heat; the guys urinate all over their face and mouths then spray the urine all over themselves. This is apparently attractive to the gals, but it gives the guys (and our barn at the moment) a distinctly heavy, musky smell – not acrid like urine at all, but a scent all the same that has such gravity that I’m afraid it’s going to soak into the barn’s very structure. It lingers on one’s gloves, coat, everywhere. 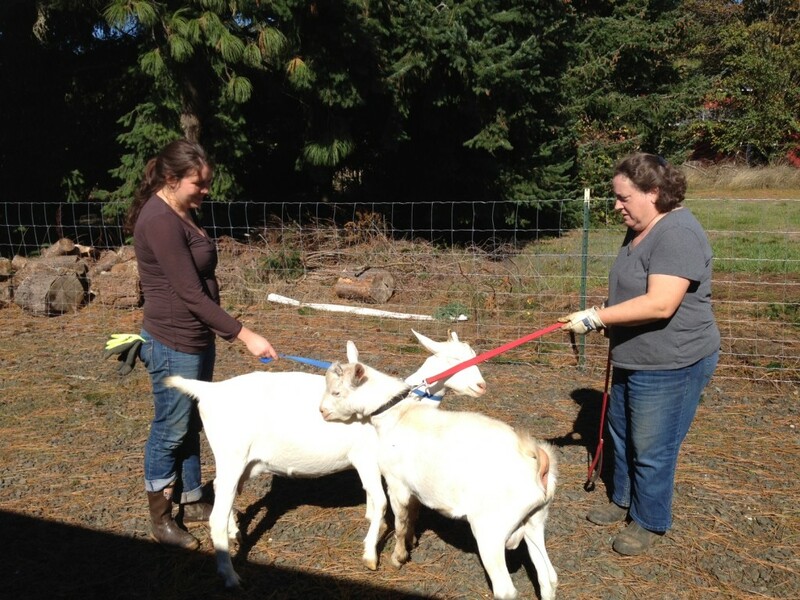 We are also now down two goats, since we had to harvest Anna and Obie – they were both sterile and ornery animals, so they are now retired. We also retired our Pink Rangers – our flock of Red Ranger chickens that we had thought to breed; we decided that the cost of keeping and raising them would, over time, exceed the cost of getting mail order chicks for raising as meat birds. They had a good run though – and in the end they processed out at pretty hefty weights, with one of the roosters weighing in at over 9 lbs. 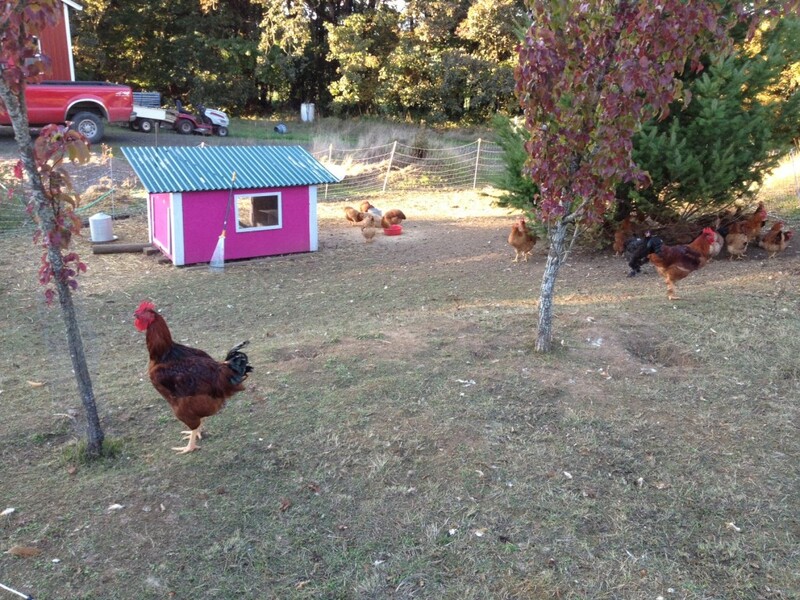 Our “Pink Rangers”, so dubbed because of the coop, were retired last week and are, I must say, delicious! 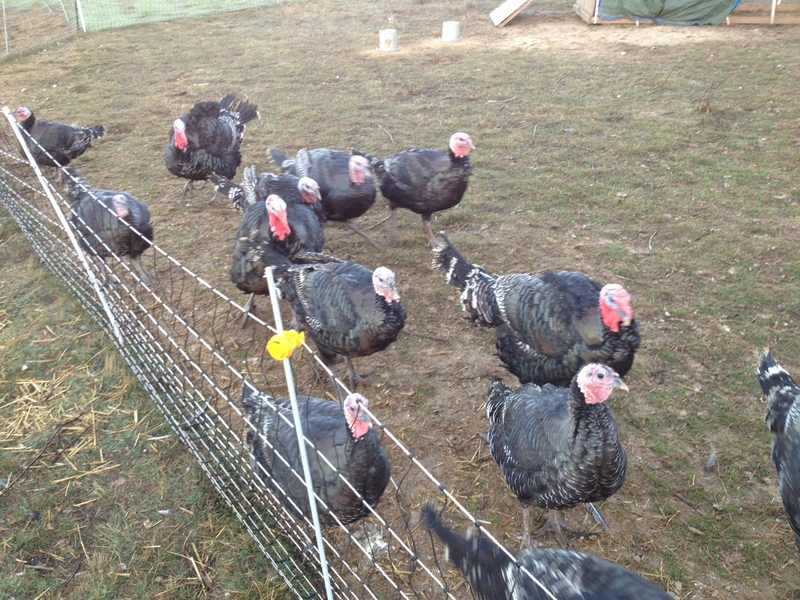 The big guy in the front, whom we dubbed “Rooster-zilla”, had a dressed weight of nine pounds. On top of everything else, October was also busy with our first stab at selling products at a public market. 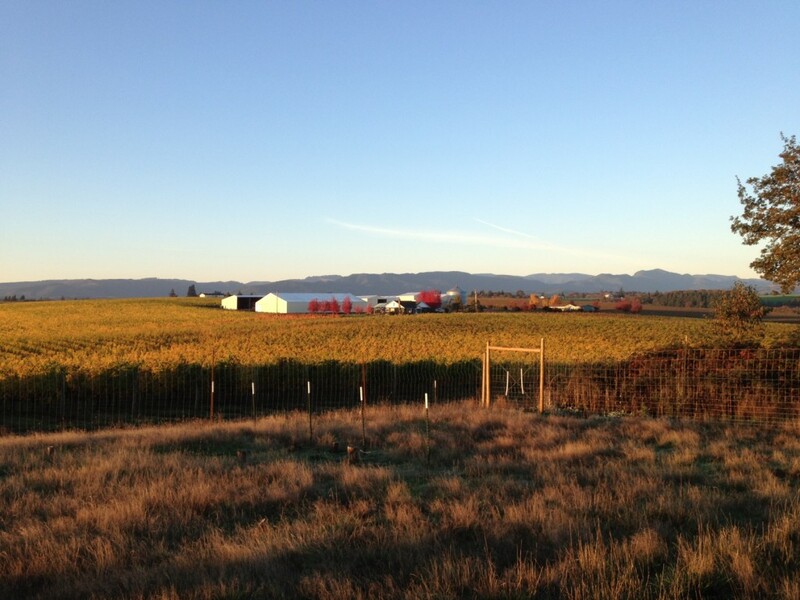 We agreed to participate in the October Fest in WIllamina, and we were glad we did. For an rather informal community event done on the fly we made out pretty well, and got to meet lots of great people into the bargain. We sold three or four jars of jam, three or four chickens, 20 dozen chicken eggs, and all 20 of our duck eggs; to say we were surprised by the sales would be an understatement, so it really has us thinking about ramping up a bit next year, particularly in the egg department. In addition all of the dahlias we had brought just for decoration sold at the end of the market. 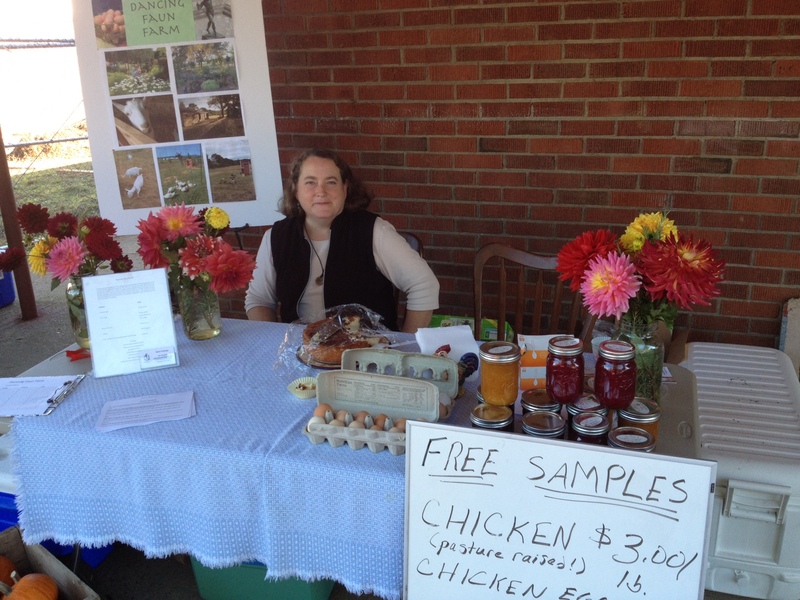 Lori and I had a surprising number of takers for our products at the Willamina Oktoberfest a couple of weeks ago. 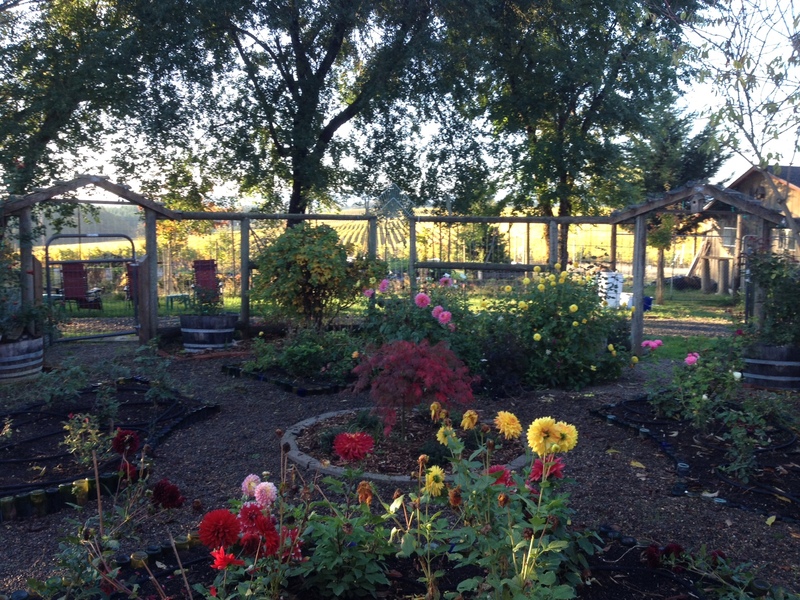 Finally, we did a bit of rose smelling in October: it is a month here that is too beautiful not to just stop and enjoy. The colors of the trees in Mac, especially on 3rd street, were lovely, and the Linfield campus where I teach two days a week was beyond stunning. 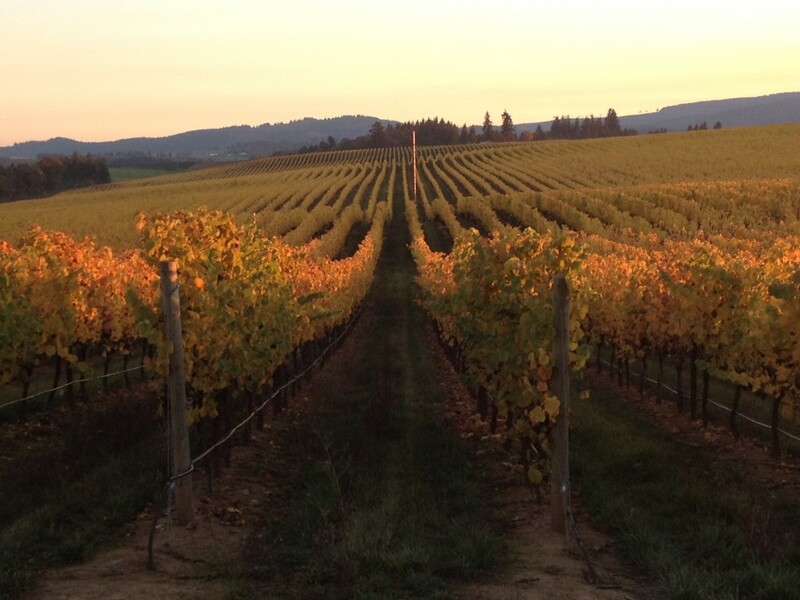 But above all there is the vineyard next door; it is as though we live next to a painting of a dissatisfied artist, who erases perfection several times a day as the light and glow of the changing hues of yellow and orange reflect the shades of morning, evening, and everything in between. 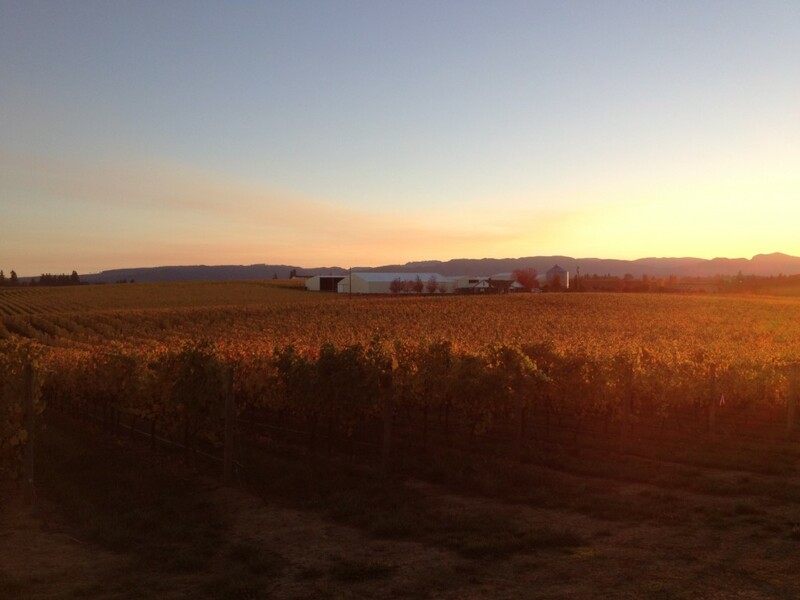 Today some green, tomorrow only yellow, in twilight orange, soon just the verdant grass with serried ranks of brown woody stem, stewarding its energy for the next vintage. 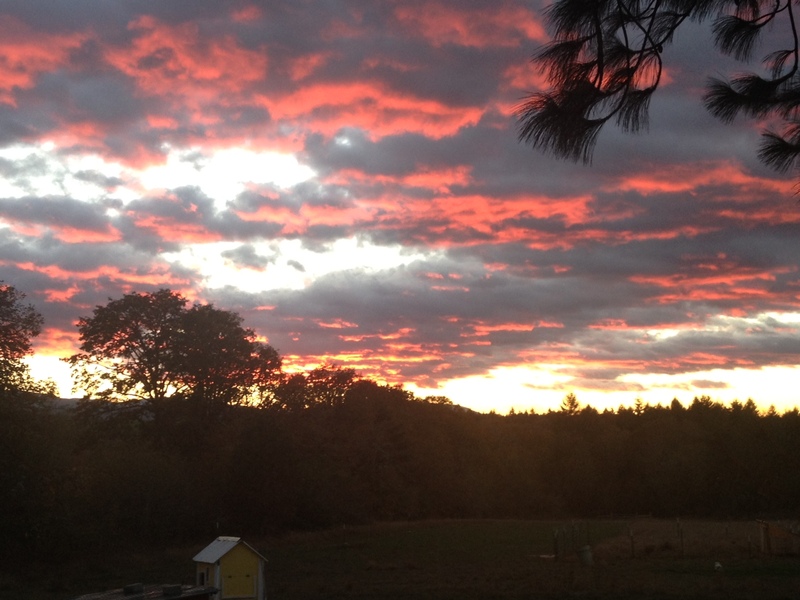 And of late, Aurora has paid us some evening visits, gifting us with some of the most spectacular sunsets of the year. No, October is not a month to leave the farm. Looking down a row of Pinot Noir at around 8:00 am on a glorious October morn . . .
. . . and a more sweeping view of the vineyard in morning light . . . Looking down the same rows of Pinot Noir just before sunset . . .
. . . with a sweeping view in the late afternoon around 4:30 or 5:00 pm . . .
. . . and the same vineyard and view an hour or so later in the warm glow of last light . . .
. . . and the final spectacular crescendo of light at day’s end. What the Cider Press Told Me. 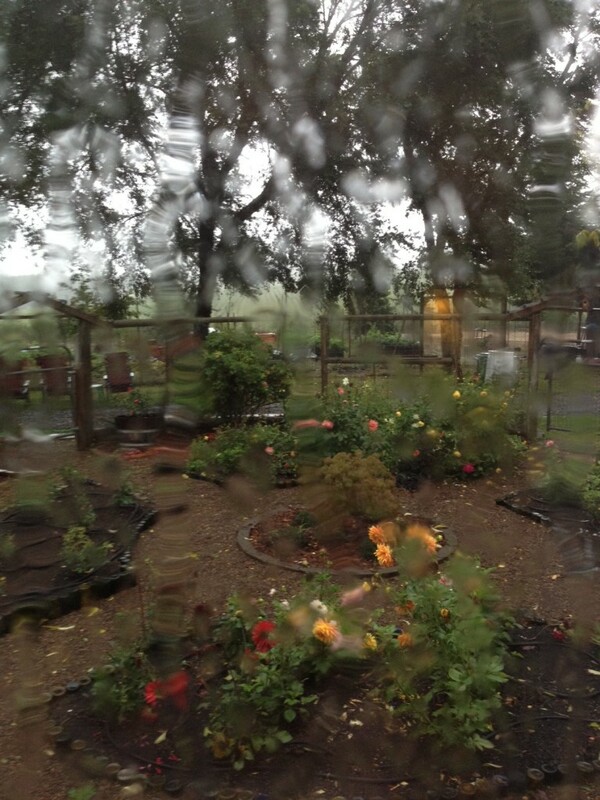 The dark season came early this year, in September, and was ushered in by record rains which stream here down the dining room windows looking out on our circle garden. Clank chnk, clank chnk, clank chnk, clank chnk. That is the solitary sound of the ratchet press as it extracts the summer’s heat and last winter’s and spring’s rain out of Demeter’s apples. Clank chnk, clank chnk. Over the course of the past month pressing apples from various orchards has all but consumed my life. I started with apples from one of Randy’s older trees; Randy has become a friend and great resource whom it has been my pleasure to get to know over the past several months. He wanted to get rid of the tree so we cut it down, and most of the apples ended up being picked up off the ground, but we filled about two barrels (50 gallons or so) from the one tree. The apples were small but abundant, and of middling quality, but pressed well. Clank chnk, clank chnk. Then came the apples, Gravensteins and Golden Delicious, from my sister’s place, followed by some from Cheryl’s, another master gardener friend. All of these were for the most part drops, and again had to be picked up off the ground, but were heavy with juice. Clank chnk, clank chnk. Karen Hoyt, a kindred spirit and fellow goat herder who has been an enormous help to us, let me glean from a neighbor’s orchard one day and gave me a cheese lesson into the bargain. These apples were cider apples, picked right off the tree, and of excellent quality. Clank chnk. Finally, our neighbors Greg and Bridget brought over some apples from Hood River that a friend had given them; these were Galas, and we mixed them with our own. Our trees were not that productive this year, but the one immediately in front produces enormous sweet eating apples that are green with some red blush and of an absolutely clean crisp flesh, while the other produces apples that are yellow, sweet but not as sweet as its neighbor, and whose flesh is somewhat inconsistent and not as crisp. Clank chnk. Each apple tree, each orchard, is a history unto itself, a story of people: of planters, of harvesters, of tenders, of those to whom the trees have given life, or made life happy, of those who have come, of those who are now gone. In all I pressed eight five gallon batches, for a total of forty gallons that I will bottle into a blend of pounders (16 oz. bottles) and bombers (22 oz. bottles), that will bring up our cider production to a total of 252 bottles this year. All are fermented with champagne yeast. Pressing and production is a solitary business, and I generally like to listen to contemporary New Age key board pieces as I labor to coax the juice from the fruit. Last week, as I pressed the last two batches, it was raining hard and steadily. The gentle stream of the music in what has become a musty, fragrant pressing room, the steady symphony of rain as a million drops play their melody on the roof, the harmony of the stream of cider as it falls from the klepsydra of the press, all are signifiers. Music, streams, water – all are markers of time. Music’s rhythm marks time, which flows like the cider’s stream, while the water clock keeps the time. A strange phrase “keeps the time”; of course, no one can keep it, and it vanishes, like writing upon water. Apples that have turned from blossoms to fruit to juice, mark the relentless succession of the seasons of spring, of summer, of fall. 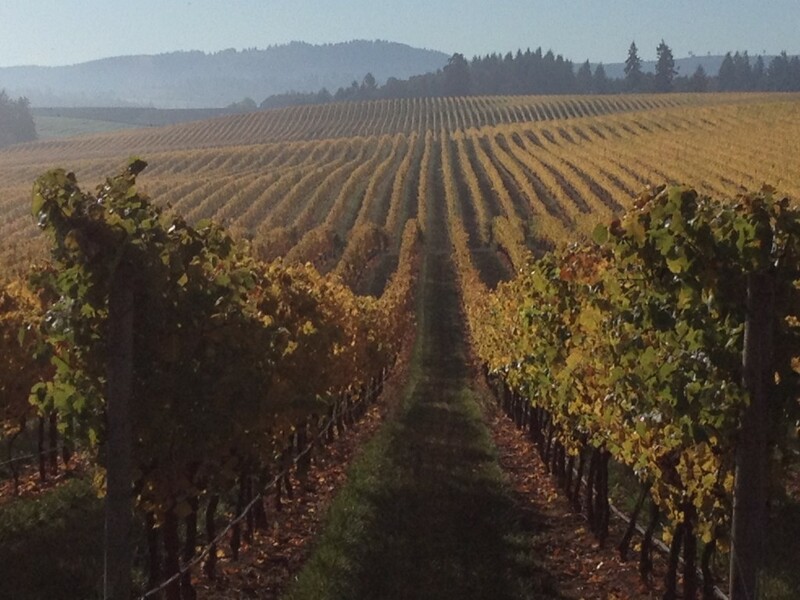 The fall harvest is not attended by the joyous strains of a Vivaldi string movement, with its visions of dancers happily stomping vatted grapes bathed in October’s golden glow. Tacitus’ description of an autumn bacchanal, with its lakes of wine flowing from vats with ecstatic dancers wearing skins of fawns and shaking Dionysus’ thyrsus in a chorus of song and carnival is decidedly absent. Revelry is there – in the music, in the gentle trickle of the apples’ juices, even in the rains. But it is tempered. It is darker, greyer, more melancholy. 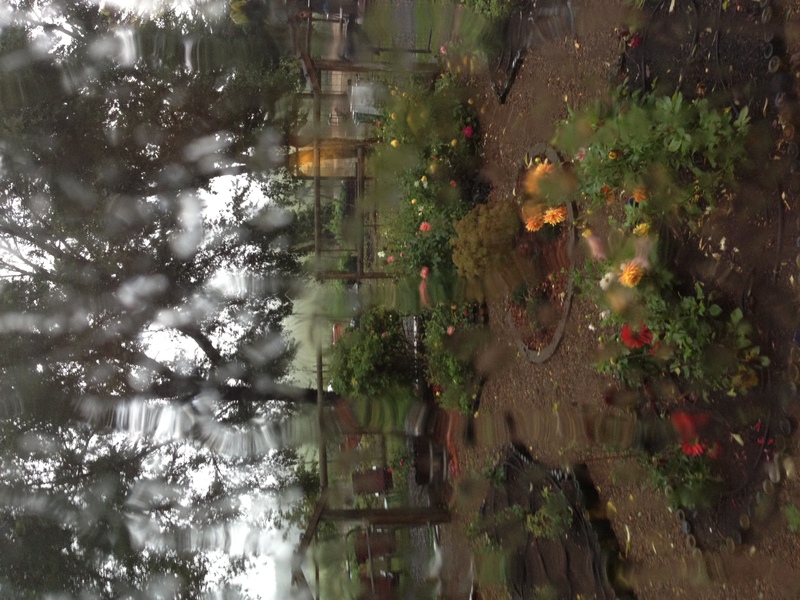 Here the harvest marks the coming of the season of darkness: October in the Pacific Northwest is the cracked door on some tomb, inviting one in to the gloom that is November, December, and January in our rain soaked region. In this grey season of rains and of mountain thunder that mark the end of summer, one cannot help but think of the passage of time. One presses, and the sound is that of an ominous mechanism that tells a story of loss. Clank chnk clank chnk. The press sounds like nothing if not an indifferent clock that presages ends – to ambitions, gardens, seasons, hopes, friends who have passed, people we shall see no more. Of a martini cat named Artemis; of a wine friend named Shirley; of carefully tended sunflowers now rain drenched and windswept, the ruins of a once great civilization of green stalks, giant golden petals, and seed. It is a profoundly sad noise, attended by its velvet score of pelting rain melting liquid cathedral windows on glass. It tells the story of the passage of seasons and years, and like Homer’s gods, it offers no hope, only a momento mori. The cider press is Death. And Death’s message is the same as it was to Gilgamesh over four thousand years ago: love your friends; drink your wine; enjoy the world. For as the rain you will fall, as the apple you will be crushed, and into the forever dark season will you enter.